Calvin is one of these types of people you are sure the world needs many more of. Always helpful, soft spoken tho smart, modest yet pro-active, pleasant personality. He gave me my 15 minute “This is how you drive the huge new tofu truck lesson” this morning. I am trying to retire from driving the tofu truck. But there are only a handful of trained Richmond delivery drivers and i do like the work. When Summer said i could loose my child care or drive the Richmond delivery this week, i said i would do the delivery, but in the old (smaller, well know) tofu truck. I was told “no problem, unless the old truck breaks down”. The old truck broke down. Calvin did take me up to Emerald City to help we learn how to parallel park this beast. I did reasonably well at it, but definitely felt like i was out of my league. One friend joked that they hoped my confidence could hold me til my skills caught up. Of course the thing Calvin did not think to tell me in our mini course is when you are parking this new bigger truck, you need to pay attention not to what is beside and behind you – but to what is above you as well. As i parked on Morris St in Richmond, i heard a terrible sound. I ran out and i had destroyed the lower branches of a small tree which protruded out into the road. The truck was unharmed. 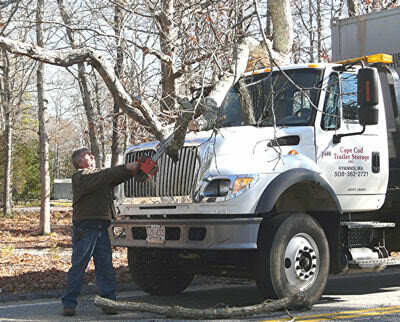 there are almost no internet pictures of trucks hitting trees where the truck is undamaged. As i drive home after an otherwise successful delivery schedule, i am conscious of all the things truck drivers need to pay attention to. Distance between the vehicles in front of you and elongated spaces needed for braking. Other truck drivers expect you to flash and blink and give them space (and i do). i feel like i am in this proletariat fraternity of the people who move stuff around and take some amount of care of each other. it is very strange imagining you as an honest-to-goddess truck driver, but of course, anyone who knows you and the nature of twin oaks also knows that the same motivations that push mainstream truckers are not the ones that fuel you. your deliveries in richmond provide the wider community with local, socially-conscious tofu, and a small village of people (rather than a wife and kids) is supported by your actions.